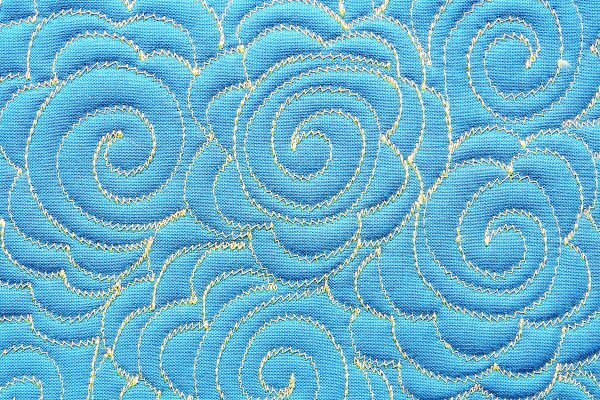 Back in March Nancy Mahoney shared some great tips for quilting with a twin needle and a walking foot here on the WeAllSew blog. But how about trying double needle free-motion quilting? Really, it’s double the fun. Before trying today’s tips be sure to review Nancy’s tips linked above for some basic information. 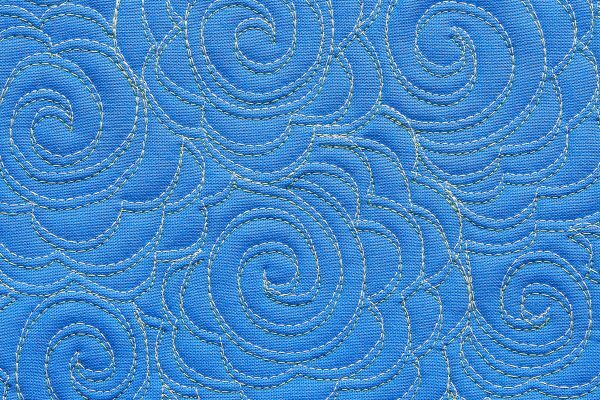 Usually, the straight stitch throat plate is best for free-motion quilting, but obviously that won’t work for double needle free-motion quilting. Use a 9 mm or 5.5 mm throat plate instead. 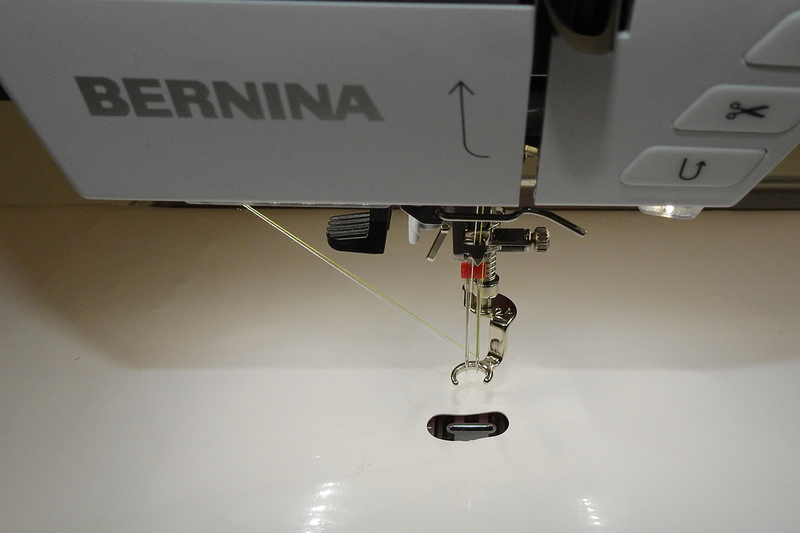 Remember that you can use the BERNINA Stitch Regulator (BSR) just as you would when using a single needle. Use a 2.0 mm to 3.0 mm double needle (size 80/12 or 90/14) and attach your BSR foot or Free-motion embroidery foot #24. Lower the feed dogs, and it also helps to use a silicon sheet designed to provide a smooth surface for quilting. Think about the effect you’ll produce depending on the direction in which you quilt. 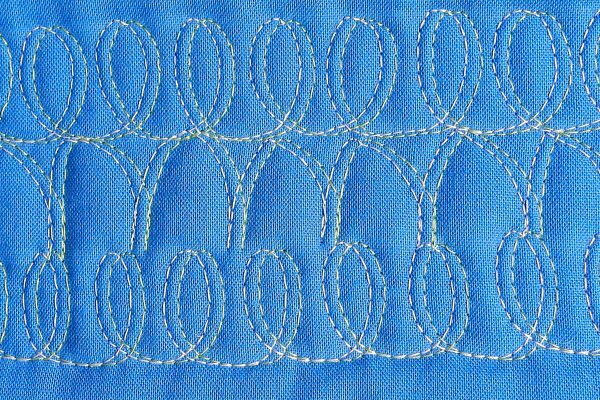 If you sew horizontally, you’ll simply produce a straight line with two layers of stitching. For this reason, I select designs that can be quilted in a variety of directions. It’s a bit like the difference between drawing with a regular pen and a calligraphy pen. With a double needle you’ll produce a wider line, and varying the angle at which you sew will create different looks. Let’s look at some examples of the lovely, and fast, motifs you can create. 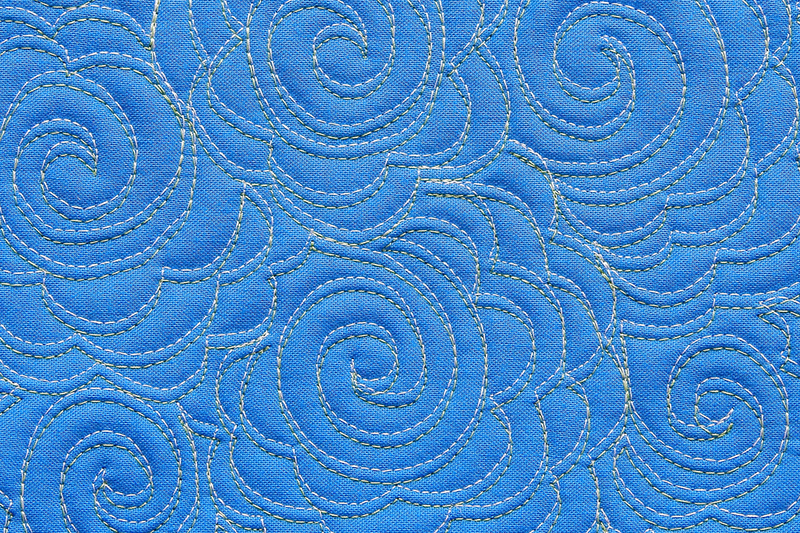 This example shows the basic “strokes” you can create while double needle free-motion quilting. 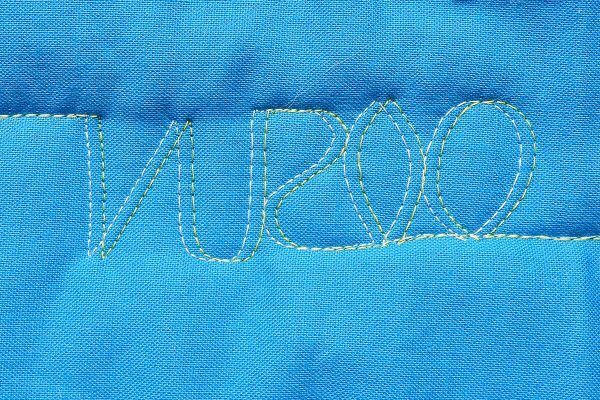 The first portion of stitching is left to right, then straight down, up to the right at about 45 degrees, a “U” shape, a backwards “S” shape, a leaf, and a circle, and finally more horizontal stitching. Notice how the distance between the lines changes depending on the motion in which you stitch, and how the lines of stitching automatically cross each other. These are the building blocks of the stitch designs you’ll create. 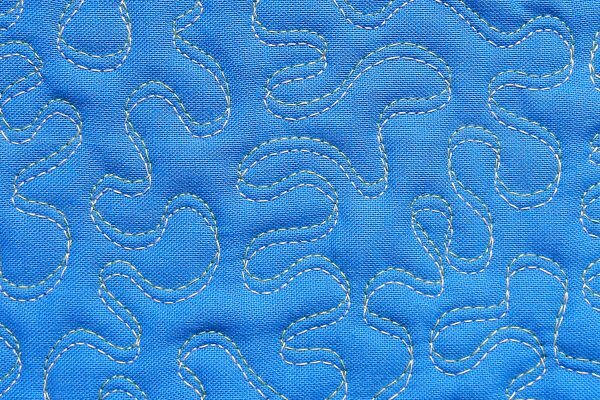 Whenever you are free-motion quilting, aiming for a smooth, even rhythm will produce a more attractive result. 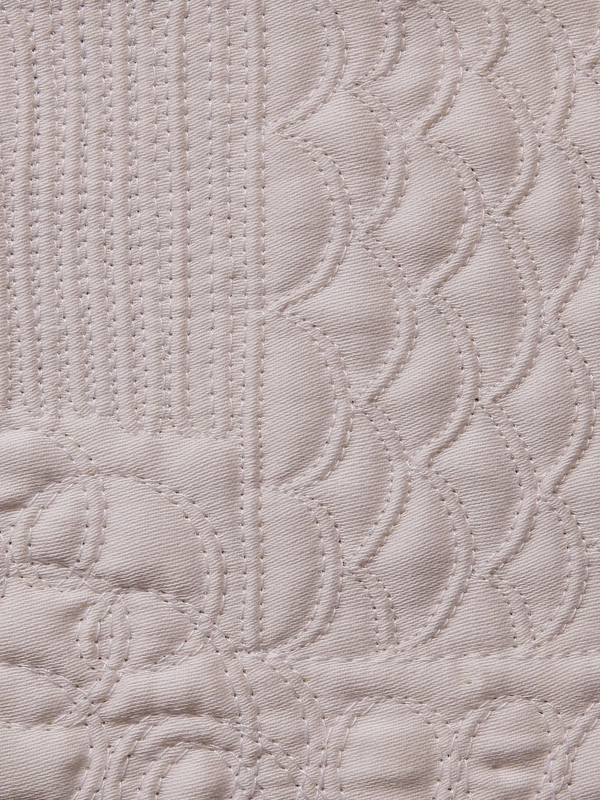 Quilting is not a race, and using an even, medium speed will help to prevent thread breakage. 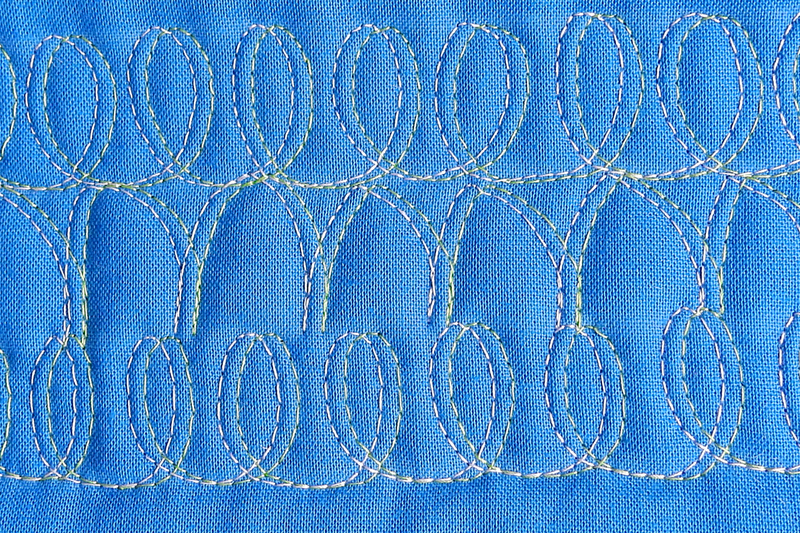 Loops and arches effortlessly appear more complex when double needle free-motion quilting is used to create them. A classic wave design is created twice as quickly. 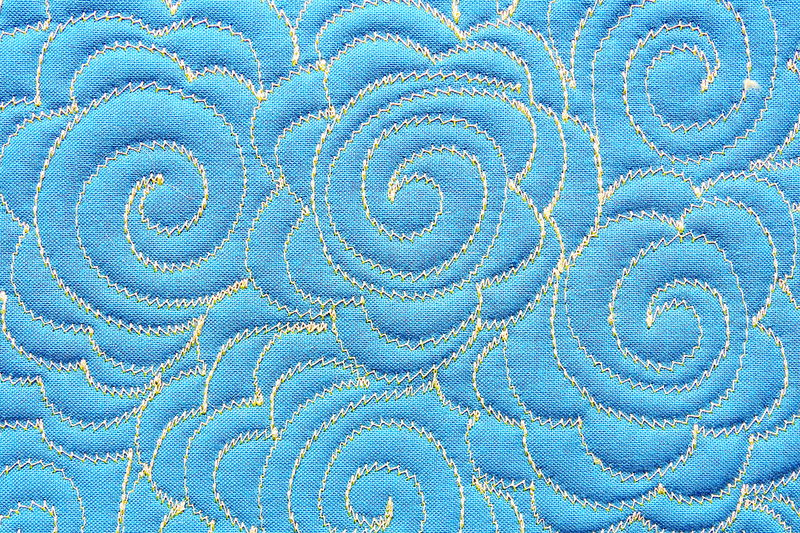 This wave design was quilted from left to right on the top row, then right to left on the second, and so on. 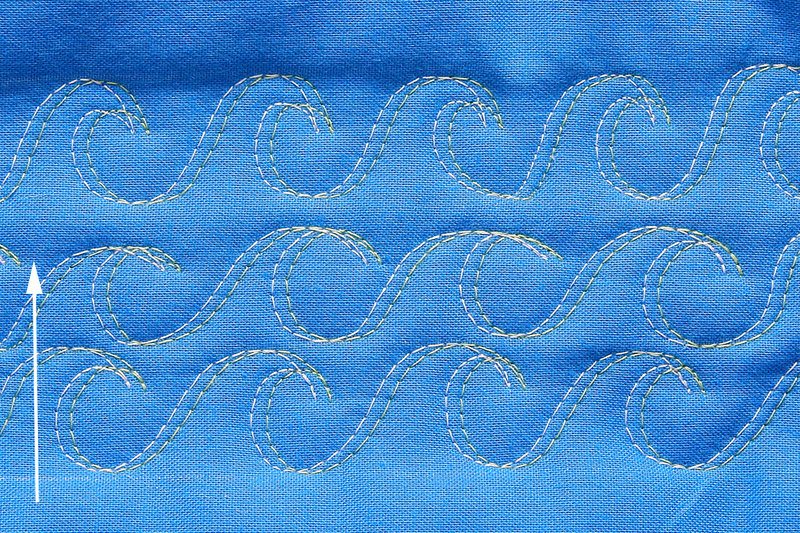 The arrow indicates that as the waves were sewn the fabric stayed in the orientation you see here. With two needles, it’s not possible to turn or rotate your quilt sandwich with the needle down without causing trouble. At first it takes a little bit of time to think about not stopping to turn the quilt sandwich, but with a little practice you’ll soon get the knack of it. 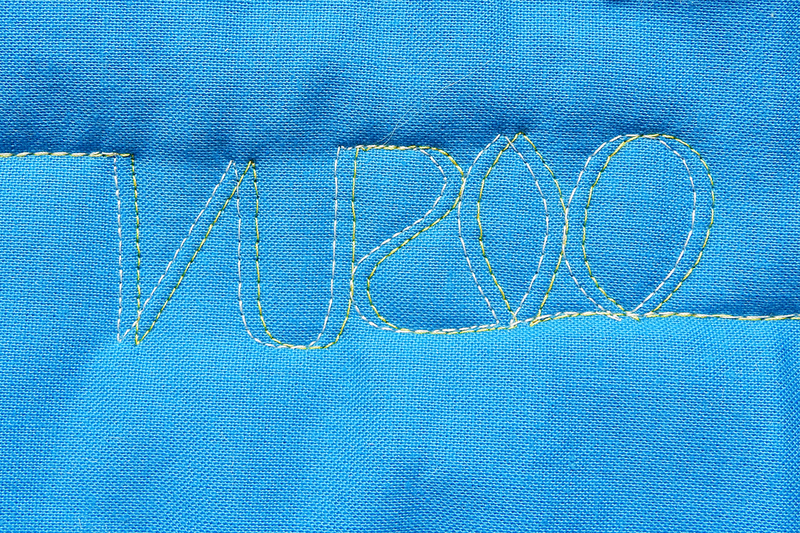 As you’re stitching you have a similar freedom of movement as when using a single needle. Stippling would be a little bit challenging to accomplish using a double needle, but meandering is a breeze. This sample has some segments that look nearly ribbon-like. This beautiful rose fill is created by spiraling in, spiraling out, then making arches around the spiral. It goes very quickly with a double needle, and the effect is lovely. One thing to bear in mind is that the back of your work will not be a pristine line of stitching. Here’s an example of the back of the design seen above. The machine creates a zigzag stitch with the bobbin thread in order to create two lines of stitching simultaneously while double needle free-motion quilting. In some cases this would not matter, such as if you are creating an accessory or a wall hanging. However, if you need or desire a more professional looking back, here are two potential solutions. One is to use the double needle stitching only as a background motif. 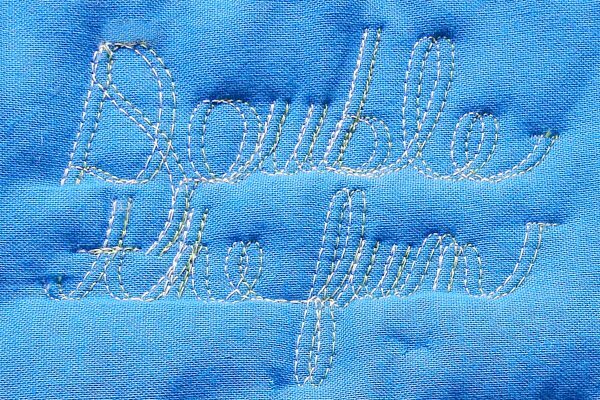 Stitch on just the front and batting of your quilt sandwich with your double needle work. Then, add a backing fabric and complete the rest of your quilting. Alternatively, go ahead and quilt on a regular quilt sandwich (top, batting, backing), then fuse an additional layer of fabric on the back of the entire piece to cover the stitching on the back. On many quilts stitching like that shown above would not be objectionable. 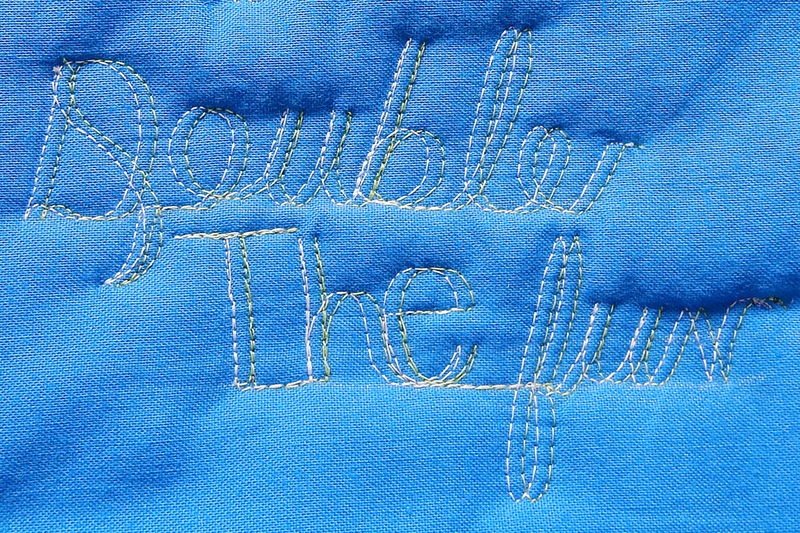 Using double needles to free-motion quilt words is very fun. The writing takes on a calligraphic look. Try mixing printing and cursive for a more whimsical look. 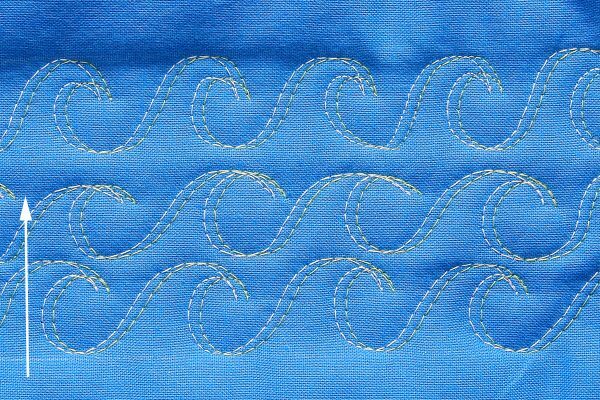 As with any quilting technique, thread selection will play a big part in the final appearance of your project. The examples above were all created using highly contrasting thread to make them more visible. 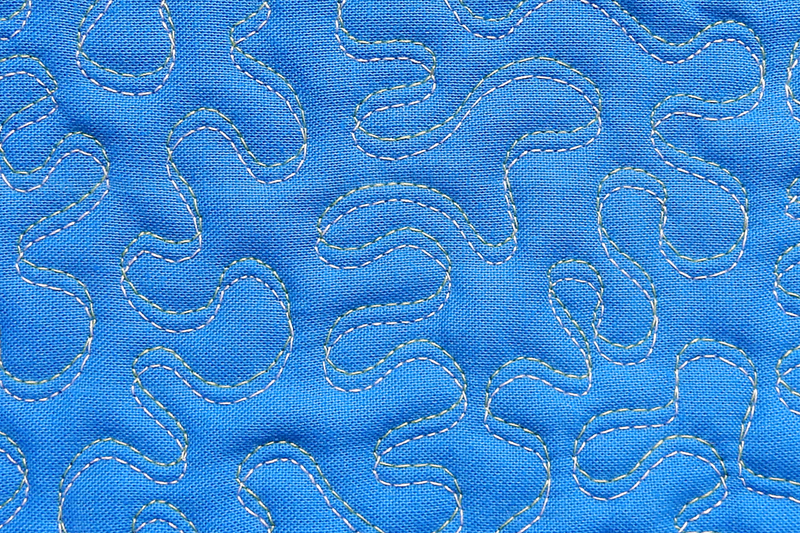 Using threads that better match the fabric color will create a more textural, less graphic look while double needle free-motion quilting. Next time you’re looking to mix things up a bit, try some double needle free-motion quilting to add a little something extra to your work. What does the back of the quilt look like? Hi, the second “roses” photo shows the back of the piece. I hope this helps. My experiences with a double needle is a zig-zag look on the back. Can you show us the back of the quilting? Hi, please see the second photo of the “roses” example above. It demonstrates the zigzag that occurs when using a double needle. Thank you for this and the BSR information. These blogs are the best and I save them every time.